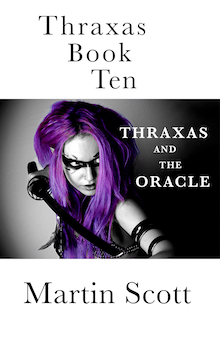 All eleven Thraxas novels are available as paperbacks and ebooks. Paperbacks availabe at Amazon, ebooks at Amazon and other online sellers. This page has links to all of these. Paperbacks at the top, scroll down for ebooks. THRAXAS & THRAXAS AND THE WARRIOR MONKS. 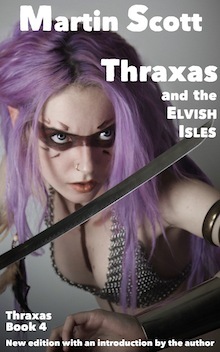 This new paperback edition contains the first two Thraxas novels. 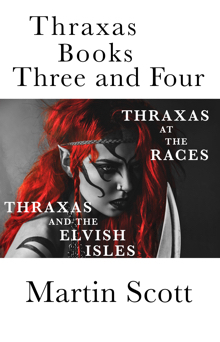 THRAXAS AT THE RACES & THRAXAS AND THE ELVISH ISLES. 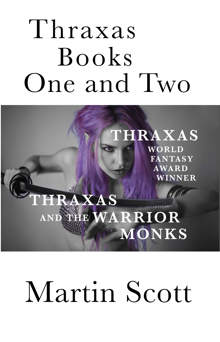 This new paperback edition contains Thraxas books three and four. THRAXAS AND THE SORCERERS & THRAXAS AND THE DANCE OF DEATH. 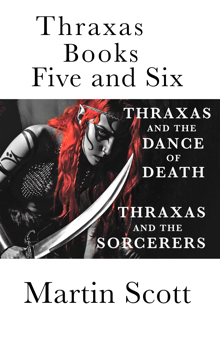 This new paperback edition contains Thraxas books five and six. 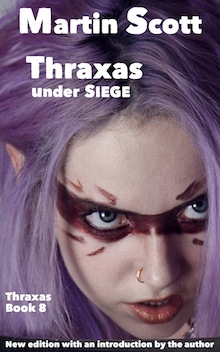 THRAXAS AT WAR & THRAXAS UNDER SIEGE. 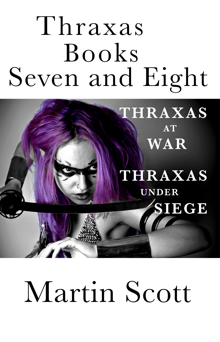 This new paperback edition contains Thraxas books seven and eight. Previously only available as an ebook, this is the first paperback edition. 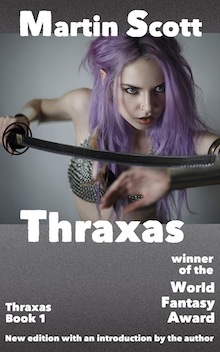 Thraxas, perhaps the doughtiest warrior ever born within that city's walls, (as he describes himself) is almost home. The army led by Lisutaris reaches Turai, ready to retake their city. 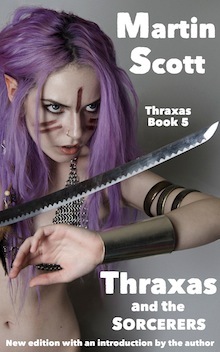 Thraxas begins the book in some trouble, having been flung in the stockade following a disreputable brawl, but will soon be back in action, investigating a politically awkward murder while making ready for battle. At his side is Makri, whose mathematical skills are called upon for some complicated sorcerous calculations designed to bring down the walls. There are dragons in the sky, hostile forces ahead, and, worst of all as far as Thraxas is concerned, a general beer shortage. When this is all over, Thraxas intends to spend the rest of his days sitting comfortably in his favourite tavern. But first, he has a city to retake. Princess Du-Akai hires Thraxas to retrieve a missing letter. Thraxas is pitted against the ruthless killer Sarin the Merciless, who's in league with the mad half-Orc sorcer, Horm the Dead. Meanwhile the city is riven by internal strife as Senators fight it out for the post of Deputy Consul, and criminal gangs struggle for control of the dwa trade. 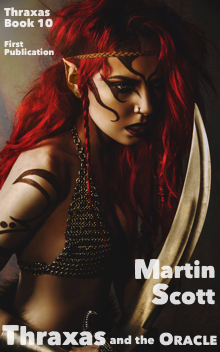 Makri is studying at the Guild College but needs no encouragement to pick up her sword and join in with the fighting. Thraxas's investigation leads him from the sewers of Turai right up to the Imperial Palace, where he finds himself face to face with the King's new dragon. In the scorching heat of the Turanian summer, Thraxas is doing his best to avoid working. His plans for a spell of uninterrupted beer drinking go wrong when the Civil Guard arrest a man for murder, right in Thraxas's office. Outraged at this insult to his dignity, Thraxas goes into action. Soon he finds himself in the middle of a deadly war between rival bands of warrior monks. Things get complicated when a consignment of the King's gold goes missing. To add to his difficulties, Makri decides to shelter to a wanted criminal which attracts a lot of unwanted attention from the city authorities. Worse, Sarin the Merciless is back in town, and the bodies are piling up at an alarming rate. Thraxas is threatened by two old enemies – Rittius at Palace Security, and Glixius Dragon killer, a very unfriendly sorcerer. Things look up when he's hired by his old army commander to find a missing painting but quickly go wrong when the commander ends up dead. Thraxas finds himself embroiled in a murder enquiry when really all he wants to be doing is gambling at the chariot races. Turai plunges into despair as the unending rain threatens to wash the city away. With the climate, the authorities and a cunning murderer all ranged against him, can Thraxas solve his case and, more importantly, emerge from the chariot races with a healthy profit? Thraxas is invited to the Elvish Island of Avula. Sailing south means he can avoid the harsh Turanian winter, and also get away from Makri, who's recent behaviour has outraged all decent citizens. Makri refuses to be left behind, much to the displeasure of the Turanian Prince who knows her Orcish blood isn't going to be welcome in any Elvish land. 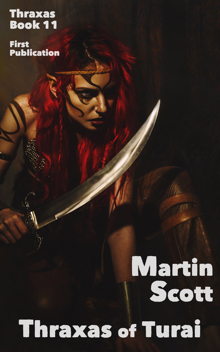 Once there, Thraxas finds himself involved in the puzzling case of the Elves' sacred tree, and Makri starts giving sword fighting lessons to a very puny young Elf. As a restful holiday, Thraxas's voyage south doesn't work out as well as he hoped. There's a lot more Elvish crime than he expected, and he ends up in conflict with virtually everyone on Avula. With the city still gripped by a fierce winter, the only thing to do is drink beer in front of a roaring fire. To Thraxas's annoyance, the city authorities won't let him rest. Every Sorcerer in the West is heading for Turai, to elect a new leader. The Turanian government is desperate for their own candidate to win. This will require cheating, bribery and corruption on a massive scale. Naturally, they turn to Thraxas and Makri. As they do their best to support Lisutaris - herself a notably intoxicated sorcerer - the sorcerers' assembly turns into the most riotously debauched affair ever seen in Turai. Winter is here again, and once more the city of Turai is as cold as the Ice Queen's grave. Thraxas would like to spend the season in front of the fire, though Makri, still determined to continue her education, complains about the Guild College being closed. Rumours abound that the Orcs are on their way. Lisutaris, Mistress of the Sky, is convinced that Prince Amrag will attack soon. Much against his will, Thraxas is drafted onto the war council, where he would be content to show his skill at the dinner table, until a senior member of the government is murdered, and Thraxas finds himself once more dragged unwillingly into the investigation. 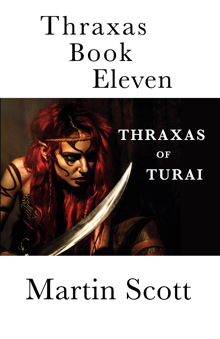 Turai is under threat, and Thraxas is troubled by a city-wide food shortage. With no yams to go with his stew, life hardly seems worth living. Things get worse when the city is gripped by plague. Even the fearless Makri finds herself troubled by the way people are falling ill all around. Soon you can't move in the Avenging Axe for casualties. To make matters more stressful, Thraxas is eager to participate in the biggest card game the tavern has ever seen, but he can't raise the money. The city needs saving and Thraxas needs money, so there's no alternative for the large investigator but to get to work, solve some crime, and earn some gold. Thraxas and Makri drift ashore in the distant land of Samsarina, in the company of Lisutaris, Head of the Sorcerers Guild. After a miserable voyage on a leaky fishing boat, Thraxas just wants to drink beer, but there are other matters to attend to. Turai has fallen to the enemy, and the armies of the West are gathering. Before war breaks out, there's the great sword-fighting tournament, which gives Thraxas the chance of almost unlimited gambling, if only he can persuade Makri to enter. 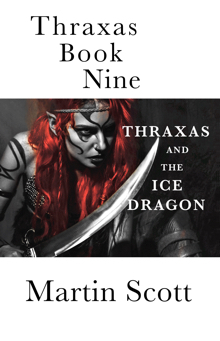 Makri is surprised to find herself looking after a baby dragon, and even more surprised to discover that Thraxas has a romantic past, one which leads them into a murder investigation in an unfamiliar land, where hostile forces oppose them at every turn. In the tenth book of the series, armies are gathering. It's time for Thraxas and Makri to march back towards Turai. Lisutaris is War Leader, and she trusts Thraxas enough to make him her personal security officer. Captain Thraxas is given the difficult task of outwitting Deeziz the Unseen, the enemy's most powerful sorcerer. He could do with some help from Makri. Unfortunately Makri spends most of her time hiding from the Elf with whom she once had a rather unsatisfactory relationship. Thraxas is relieved to meet a few familiar faces, refugees from Turai, but as he tries to prevent Deeziz from ruining the war effort, he finds himself baffled, outmanoeuvred, and badly in need of beer.